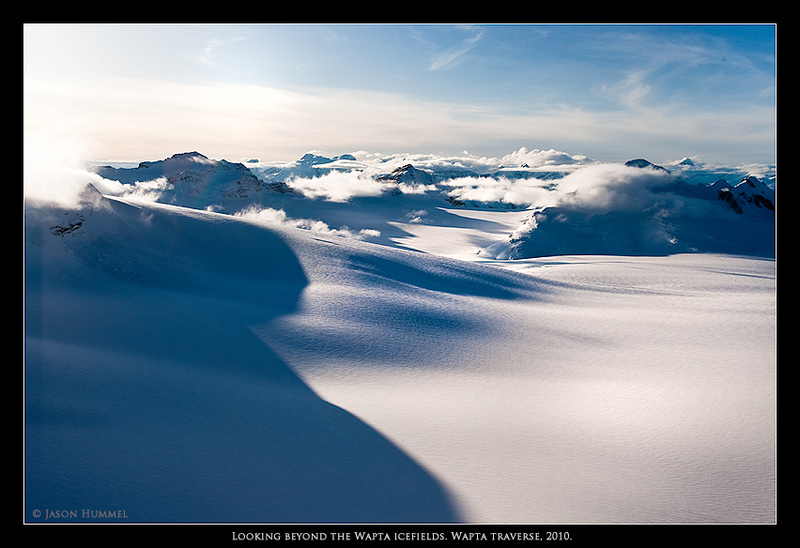 I look outward into the Wapta Icefields and beyond, squinting. A hazy mirage of mountains mold into sun-blurred castles of rock and ice. 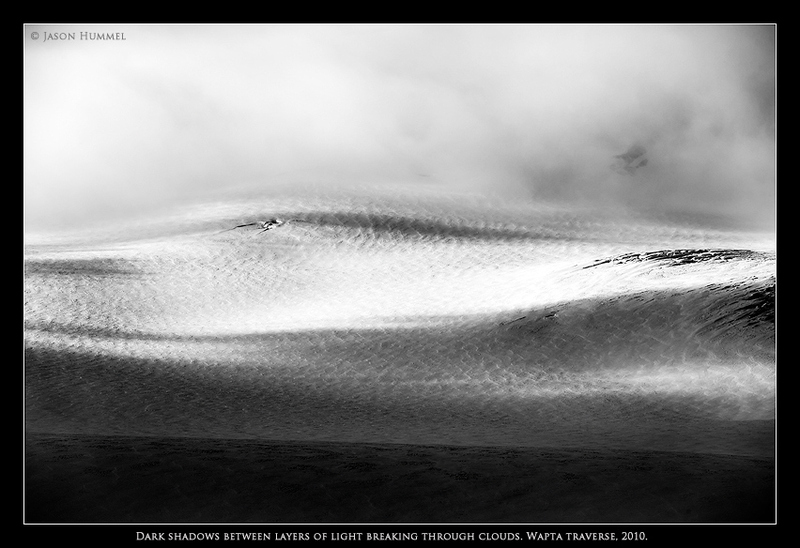 Just then, as if they materialized from nowhere, clouds appear from the east, piling up on the Continental Divide like waves on the beach. That constant wind buffeting my face all morning had left by noon time. 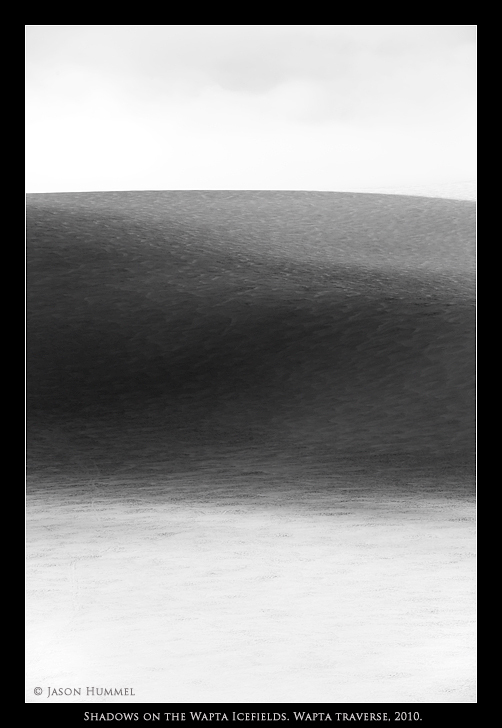 For the moment, I hear nothing - see nothing but great white vastness. Like a flea lost on a sea of bed sheets, I cannot find an end to this ice; it stretches to the horizon in all directions - flat, steep, and rolling; broken, busted and looming; blowing, swirling and drifting. 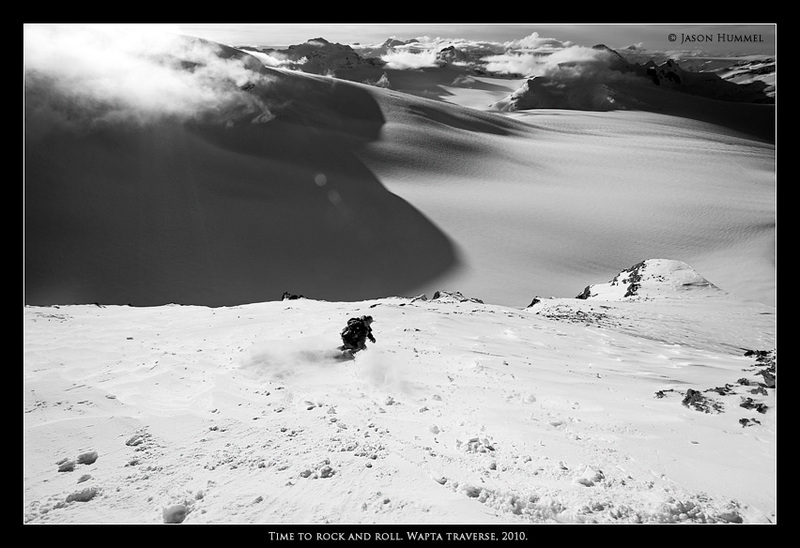 If not for my ski partners, Cecile and Sky, it would be lonely here. 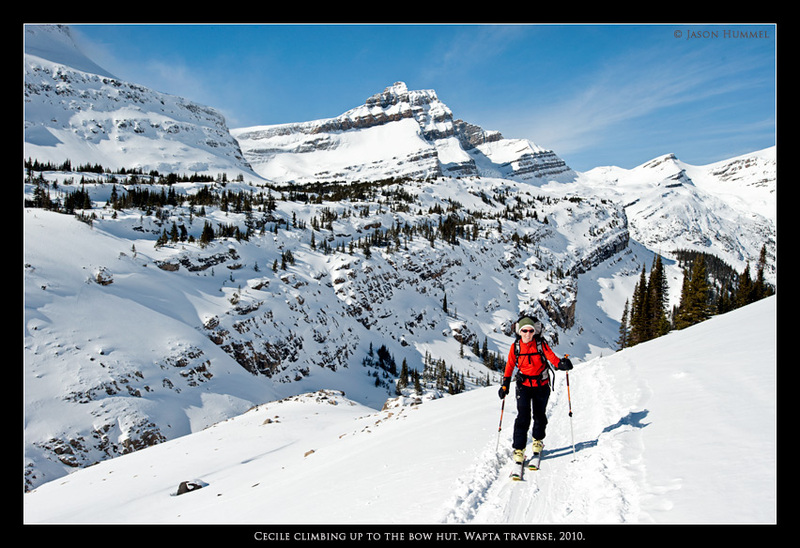 Instead smiles are passed back and forth as we traverse towards 10,270-foot Mount Olive on the second day of our journey along the Wapta Traverse. The day before we are cruising across Bow Lake toward the Ice fields. 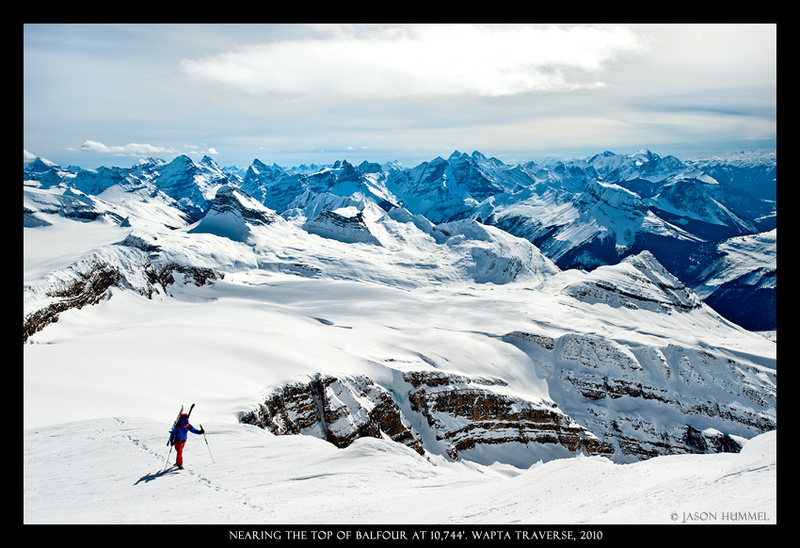 Our plan is to ski the Wapta Traverse, a popular and beautiful high route through the lofty Canadian Rockies. 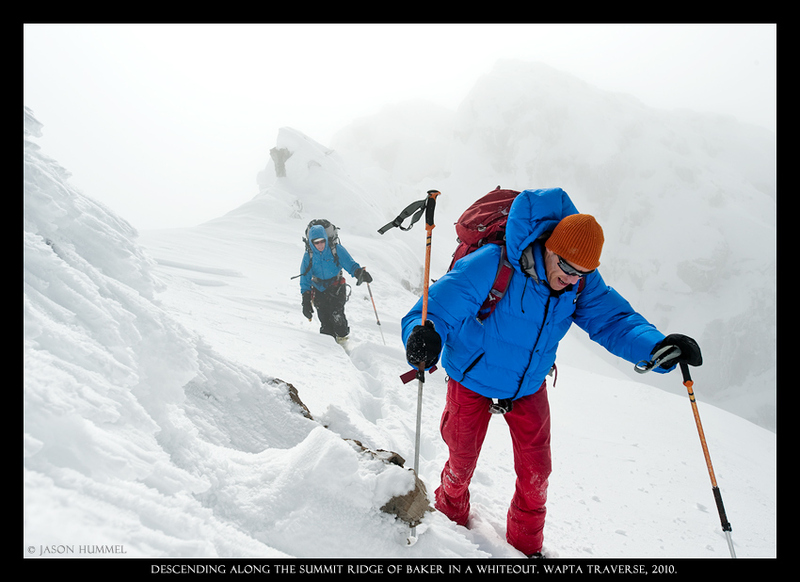 Persistent weak layers from recent snowfall made our plans for Columbia Peak less attractive. 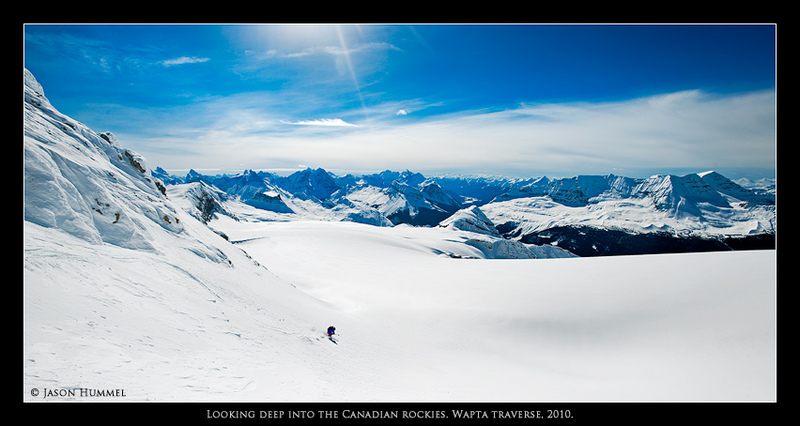 Like our trip to Banff in January, other alternatives were searched out. Thus is why we are now on the Wapta. Each step forward was making me less and less concerned about the avalanche conditions, especially as I knew we had a few days to let them consolidate. For us, our plans were malleable. Just that morning we had spotted this trip in a guidebook. Such spontaneity is important here or anywhere. You come and see what there is, and you maximize the opportunities you find at your feet. South faces less avy prone? North face wind loaded? Who knows? You just have to take what you have and run with it. 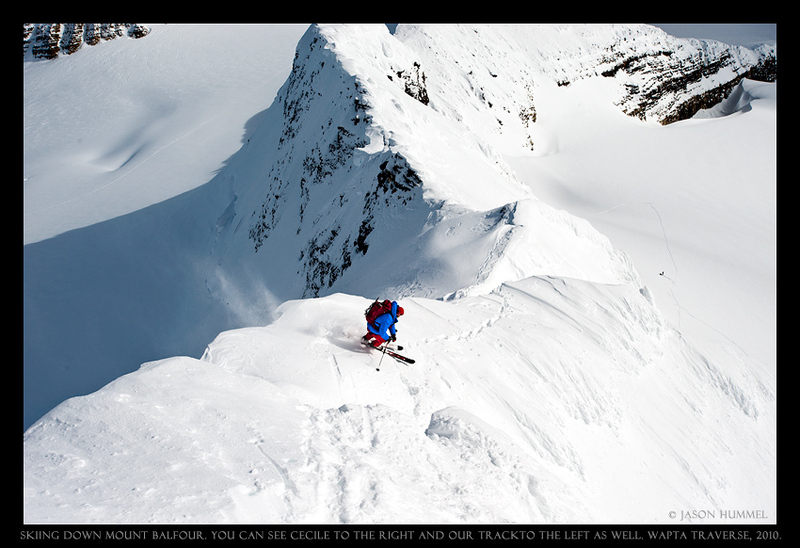 That being said, avy danger is on my mind as I watch a cloud of snow wash over a mountainous shoulder. "Look and see," I tell myself. 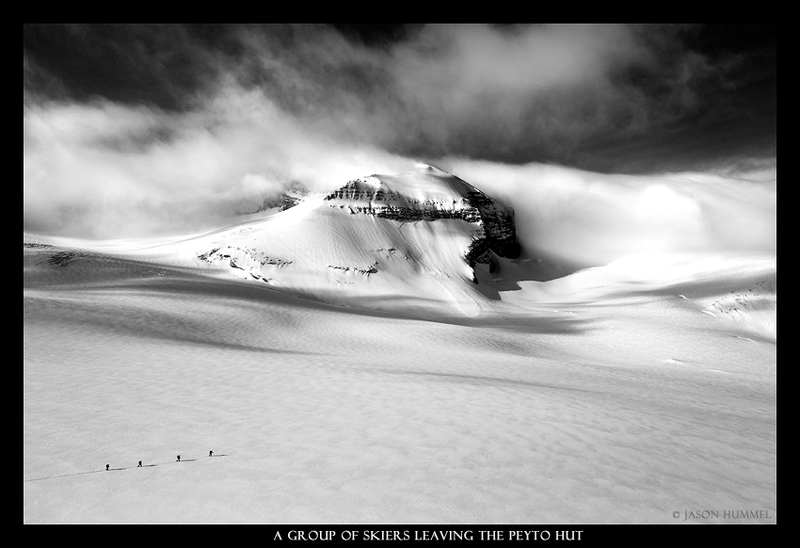 As we rounded a corner, we became more confident of a safe way ahead and within a few hours we were at the Bow Hut. 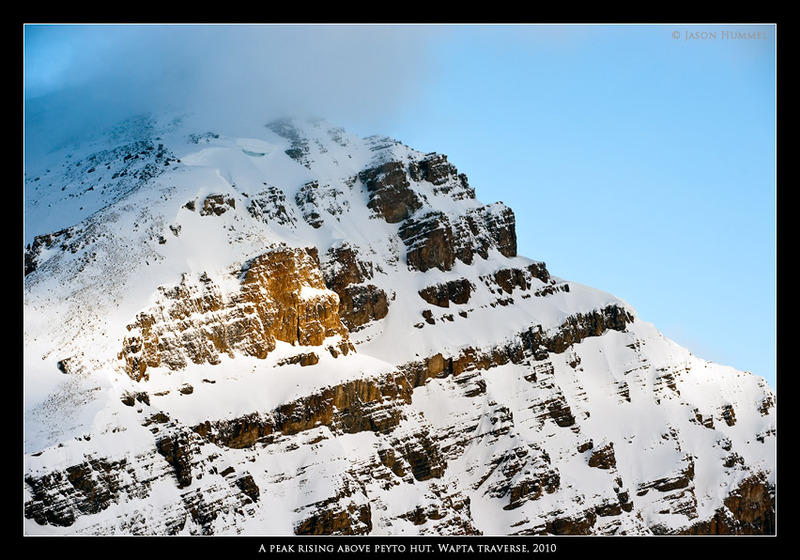 Once we fill up with water and a snack, we decided to continue on to Peyto Hut, so we'd be better situated for climbing the following morning. 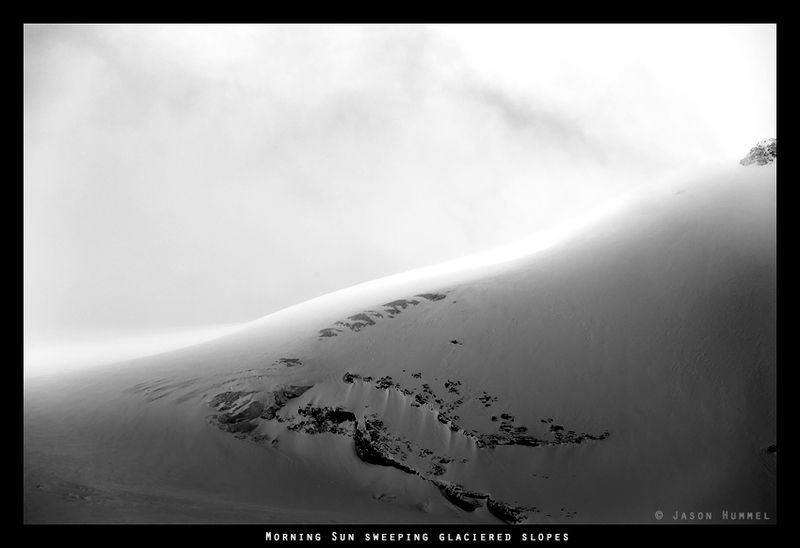 Since it is late, sun and shadow begin to play on slopes ahead. Snow traces lines like an artist's brush. 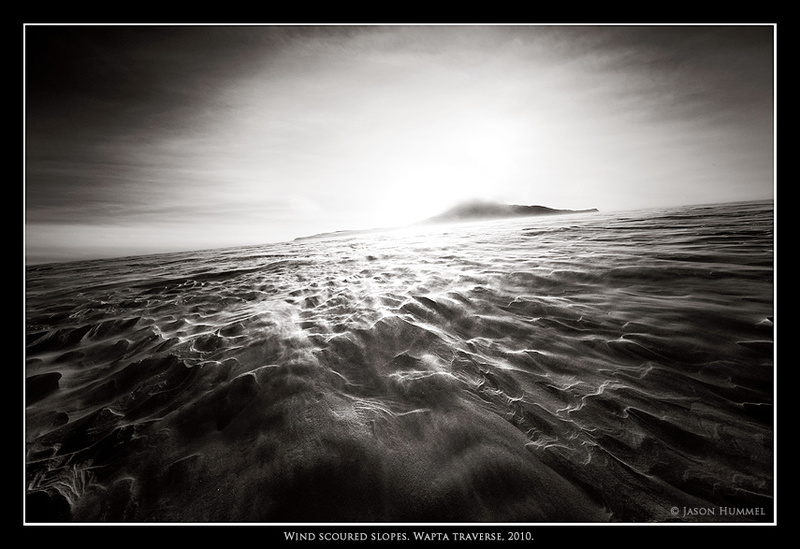 It's among my favorite natural forces - this wind. What doesn't translate in words or image is the sound or the push and pull of that interminable energy. Often I wonder if I, so absorbed in the moment, would just fall apart into a million pieces of ice and fly away across this wintry expanse. 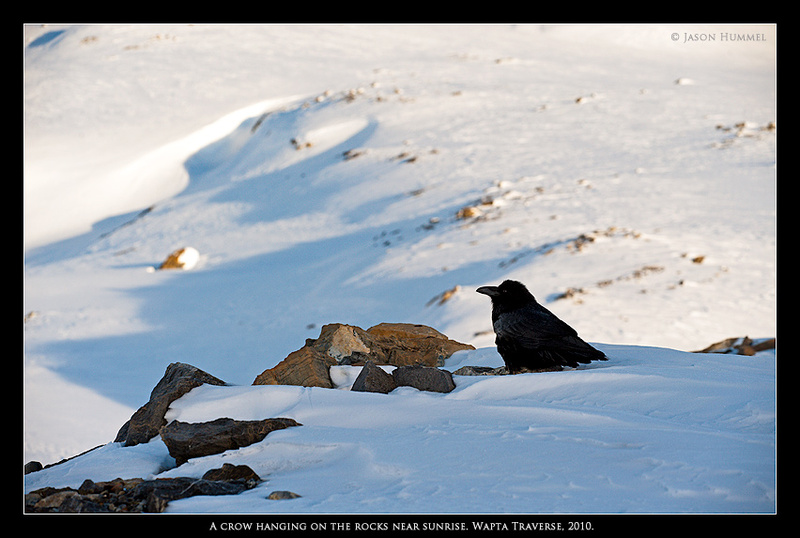 What snow piles up on rocks and glaciers is carved with wind over and again, through melt and freeze, through all the seasons. 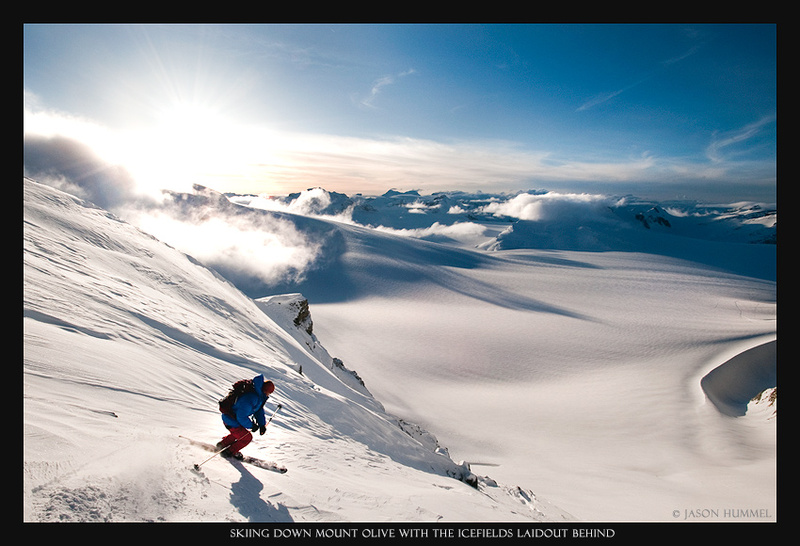 Such energies are what make the mountains an ever-changing environment. On the following morning of our second day, we break from our lackadaisacal eating and packing to finally be set on our way. Sky is intent on Mount Baker, which for those of us from Washington State will recognize the name as our estimable and northerly-most volcano known as Mount Baker. 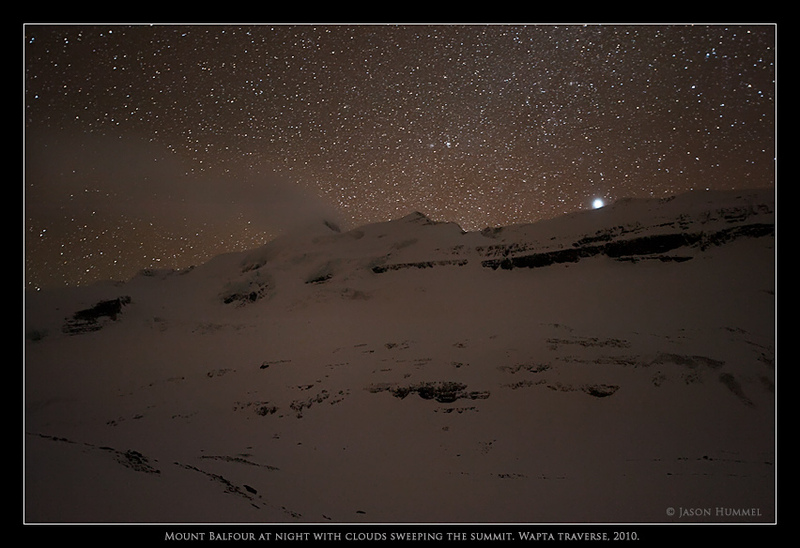 From over the Continental Divide clouds stack up and rise over. At first, fingers sweep over us and dissipate. 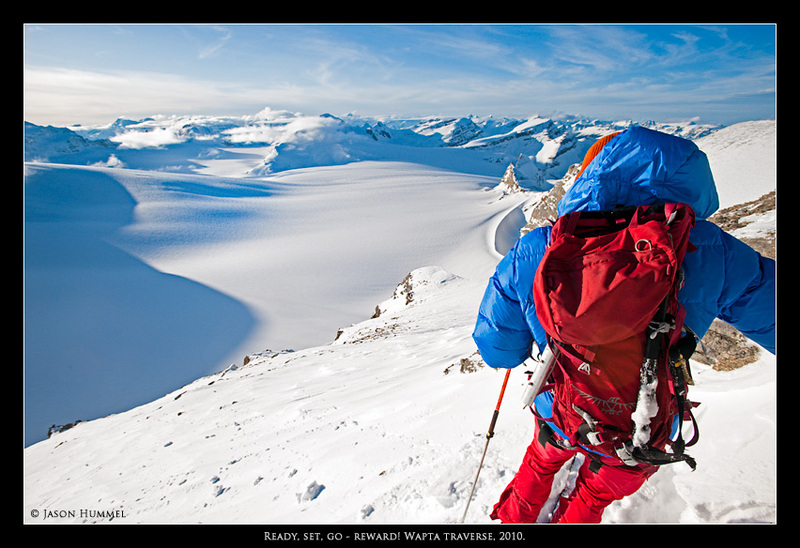 Then, as we climb to the 10,000-ft ridge line, we are lost in the white sameness, pushing forward only because higher realms appear ahead of us. Near the top I see Sky working through deep snow as he boots to a short rocky climb. "How does it look?" 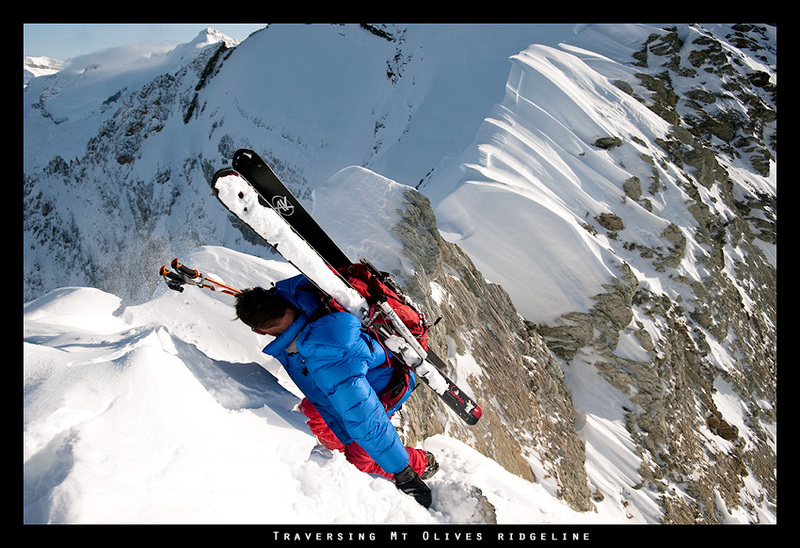 He doesn't know yet, so I leave my skis and climb over. By then he is atop and throws down a rope for me. With a few careful moves, I am walking by him and standing on our first summit. Wonderful! I'd tell you about the views, but I had to imagine them instead. Soon, Cecile follows after I am back down. The ski was fast. We traverse as far as we can without putting on skins. This lasts for a few miles, in which time the clouds peel back and reveal a wonderful day. Ahead of us is Mount Olive, and Sky is drooling. I can't help but join him, but like everything in the Rockies, size is susceptible to misinterpretation. The face was not nearly as big as I thought, not that it wasn't nice. Considering the avalanche conditions, we are just lucky to be out here. After climbing over a pass, then up a ridge Sky and I make it atop what we think is Mount Olive. It was not. 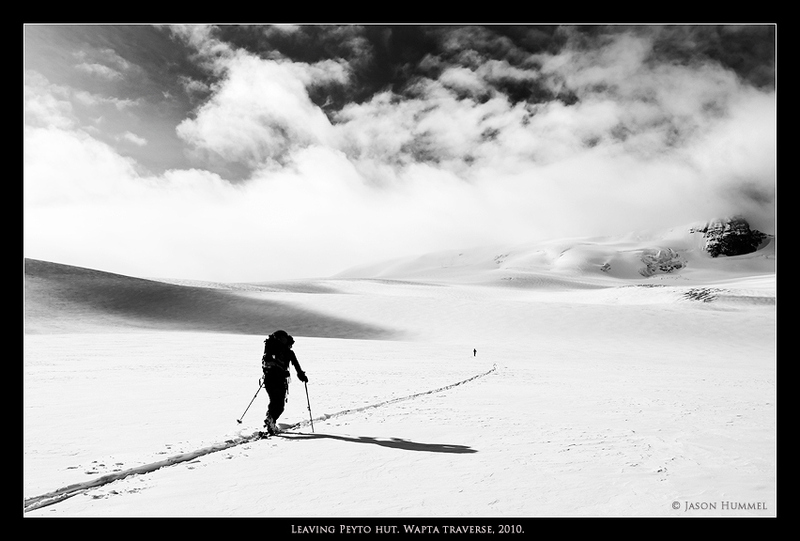 Further traversing is required. 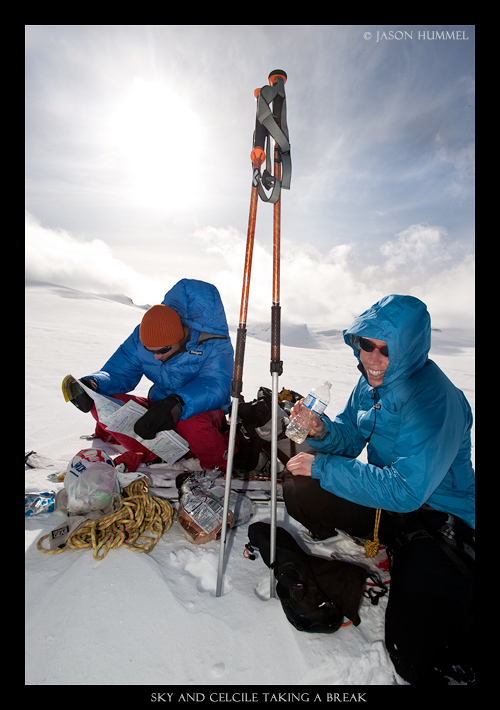 Climbing beside a cornice, we scramble over rock and deep snow to the true summit. By then the sun is melting into the way we'd come, casting bright shimmering pink over miles and miles of territory lying below and ahead of our descent. Dropping into it was a delight! 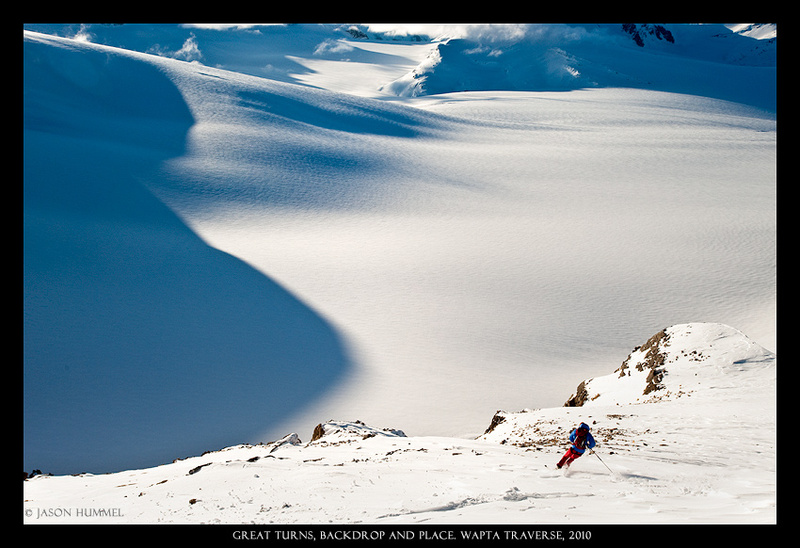 Cecile is above us as we glide over the flat ice field below the peak. She is soon coasting down bringing our skins, which we had left thinking we would return the way we'd come. Thanks Cecile!!! 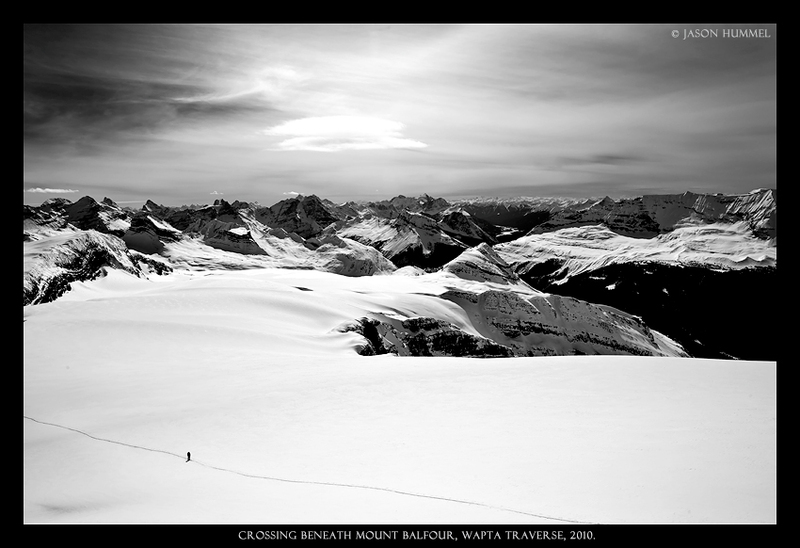 To finish our day, we drop several kilometers to Balfour Hut, which rests below a peak by the same name, Mount Balfour, the tallest mountain along the entire traverse, at 10,744-ft. 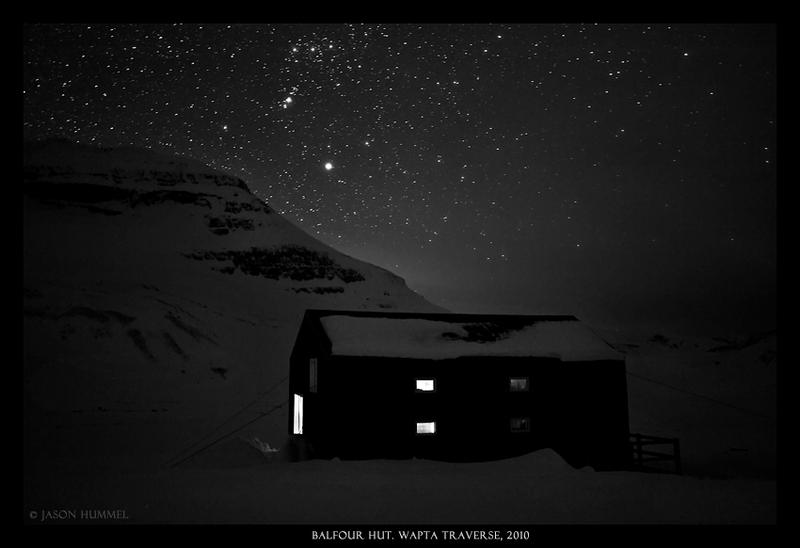 I spent an hour trying to capture a night photo of the hut and the mountain. 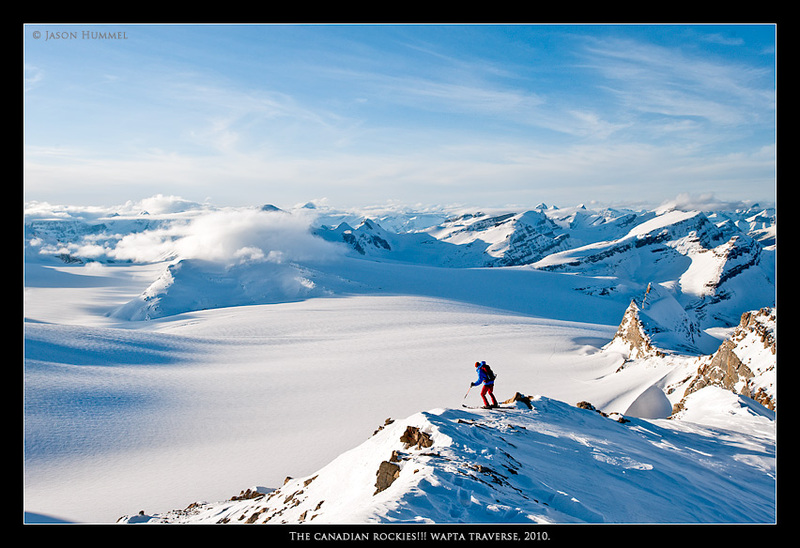 Unfortunately having lost my shutter release on a previous trip (The Picket Traverse), I was limited to the 30 seconds available in-camera. 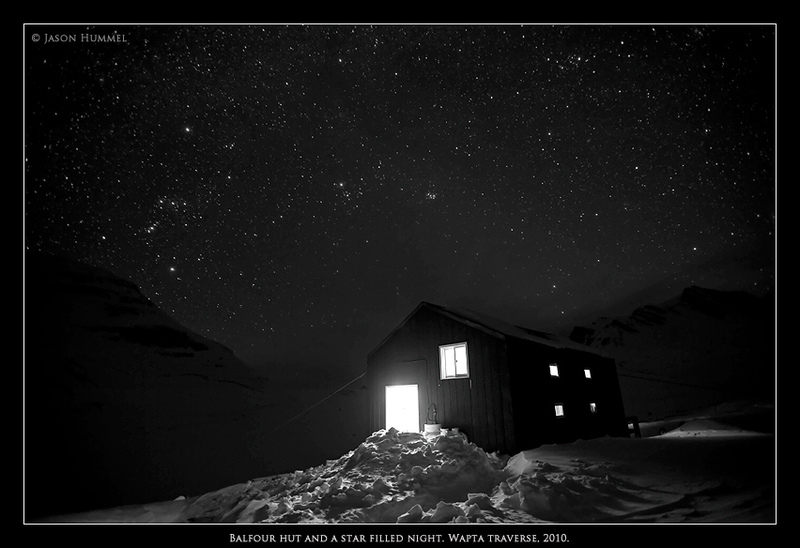 Nevertheless, being so far from city lights – the darkness permeated the sky with Orion's Belt sparkling ... brighter than I've ever seen, jumping out of liquid blackness with a brightness that feels awkward after 10p.m. Our final morning begins as nice as the previous days. No overhanging clouds, but as we've seen they can come with a fury! 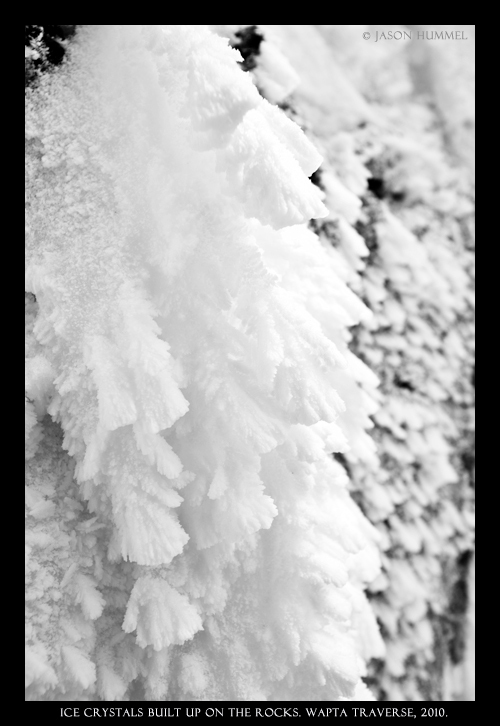 With Cecile and Sky ahead, I follow as we climb beneath hanging icefalls along a gentle ramp leading to a col. Proceeding quickly, wind pushes from the side, then stops at which point the sun's heat boils us. As soon as the heavy jacket is packed, the wind rises again, a comedy of 'on and off' that has played for this entire journey. Sky is once again drooling, this time over Mount Balfour. 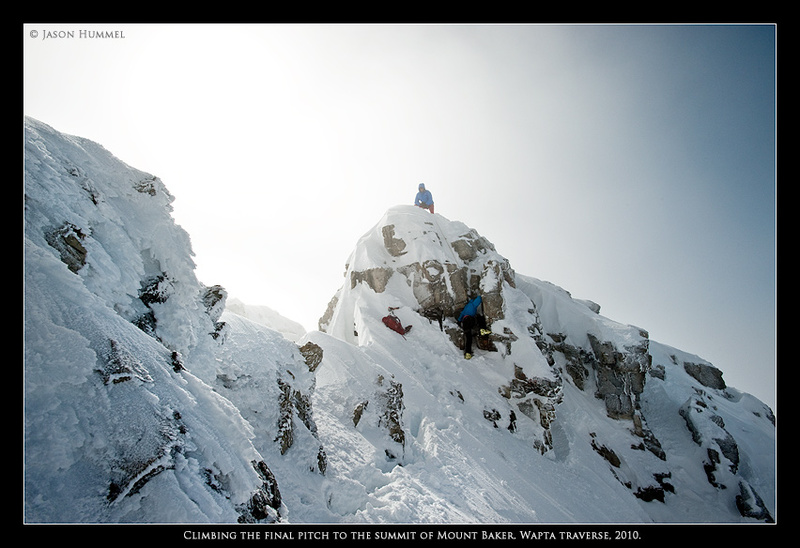 I know the glaze-eyed look he gets, the same one I'm seeing when he casts his head back at me to ask, "We should climb this ... it's the tallest peak along the traverse." I can't argue. Cecile decides to stay behind while we climb a snaking ridge to the top. Like Baker and Olive, it takes much longer than we expect, with every rise looking like it will be the last, when in fact there are two more. Eventually we've surmounted the last of them. We are atop! 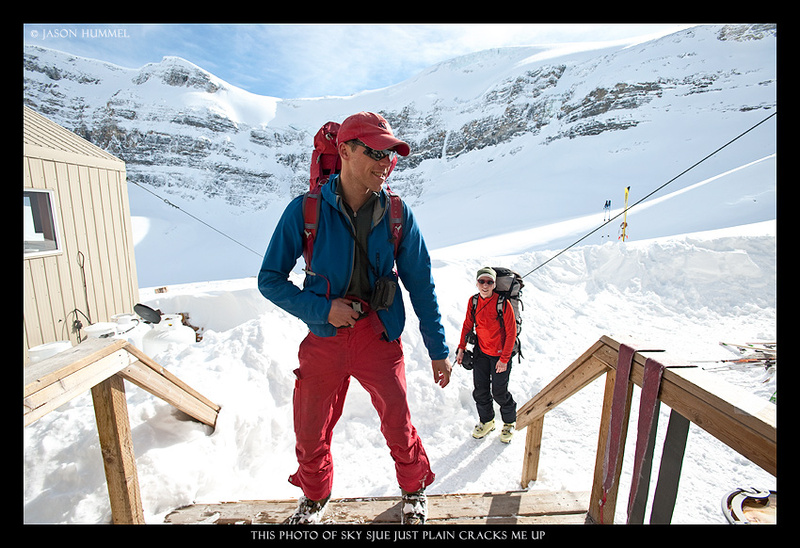 Below is Balfour Hut, behind us are the peaks above Lake Louise and ahead is Mount Hector. 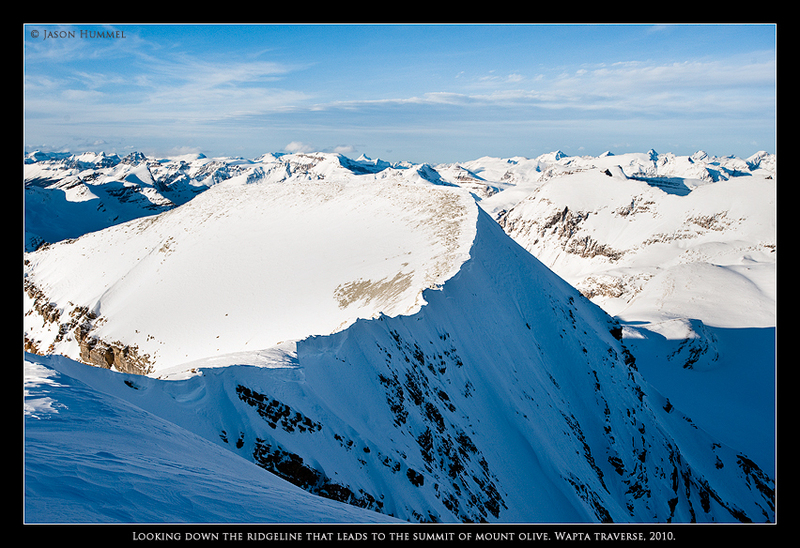 Between is an astonishing number of summits, enough for a lifetime! 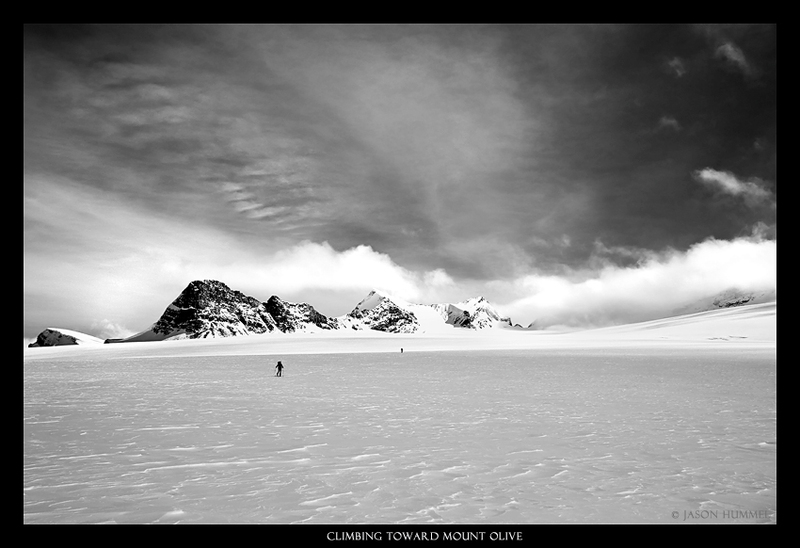 Sky leads the way, and I follow as we reverse our course down the mountain through wind-scoured snow and ice. 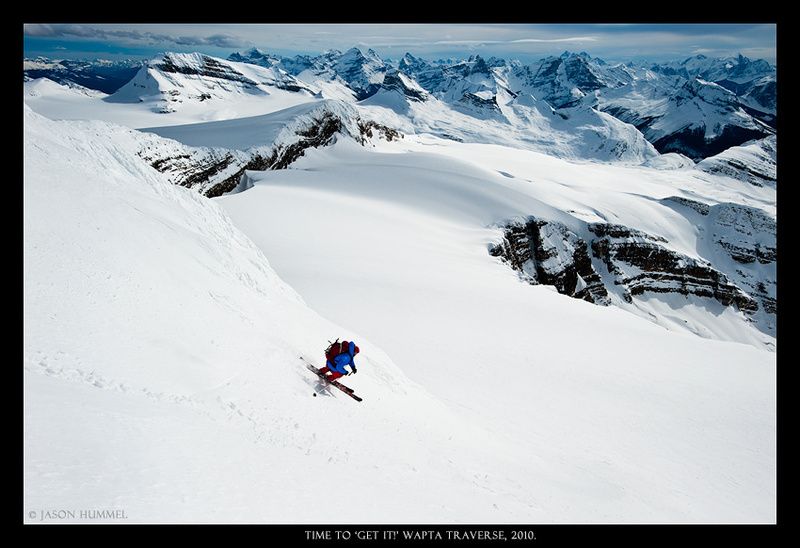 As we break free of the upper slopes, we glide back to Cecile with powdery snow washing over our skis. 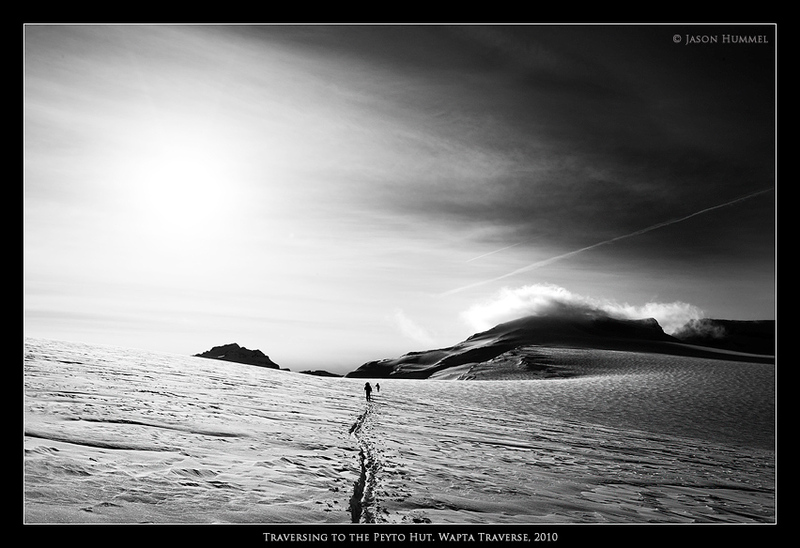 The remainder of the day is mostly descending with a few small uphills on our way past the Scott Duncan Hut. Several miles separate us from our last pass and a few more from the end. 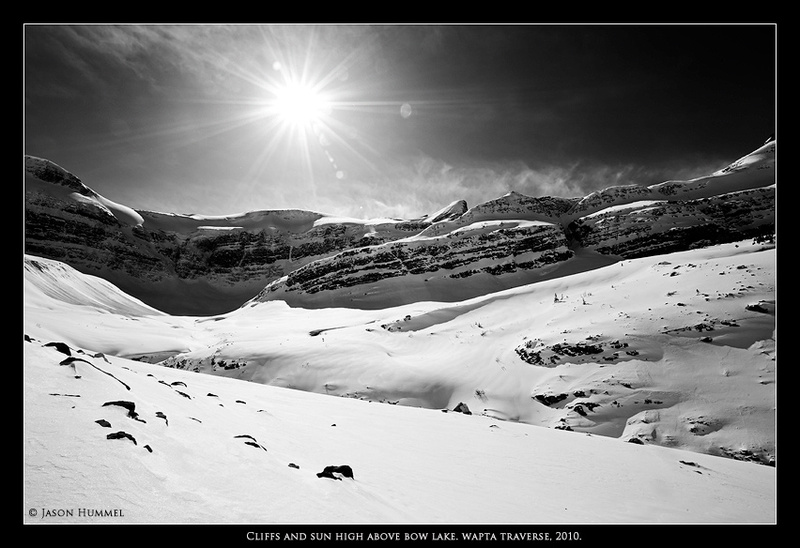 A few hours later I am finally across a large icefield looking far down into the reaches of Sherbrook Lake. 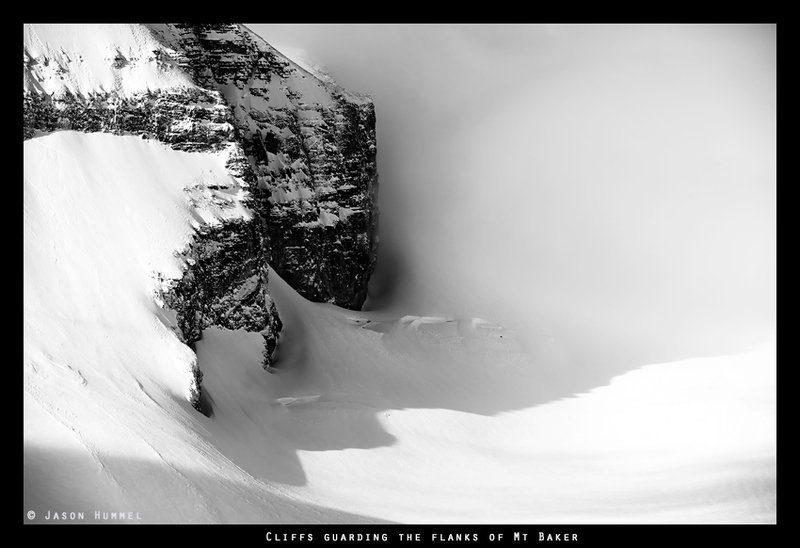 Overhead clouds bustle - busily moving ahead toward market, high on the glaciers we'd come over. There is a sparkle in my eye when I have to look away. I can't ignore those feelings; they are why I came here. 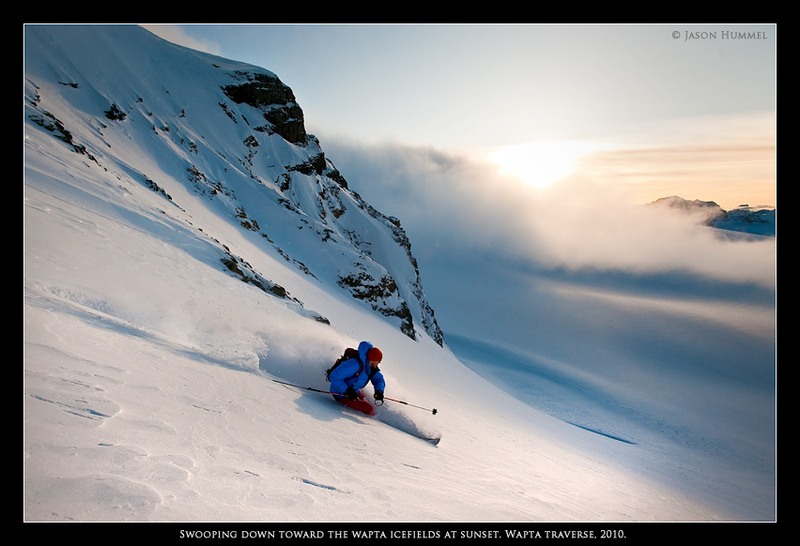 Happily we drive our skis forward traveling at the kind of speed that makes skiing so enticing to me. Even as terrain falls away, I take in the changing attitudes of scenery which quickly fill with scrubby trees, then tighter and taller groves of them. After easy traveling through softening snow, we are at the lake, which minutes before had appeared so far away. Ahead there is more terrain to cover, but it is of no consequence. Quietly we glide across the lake thinking about the way we had come. 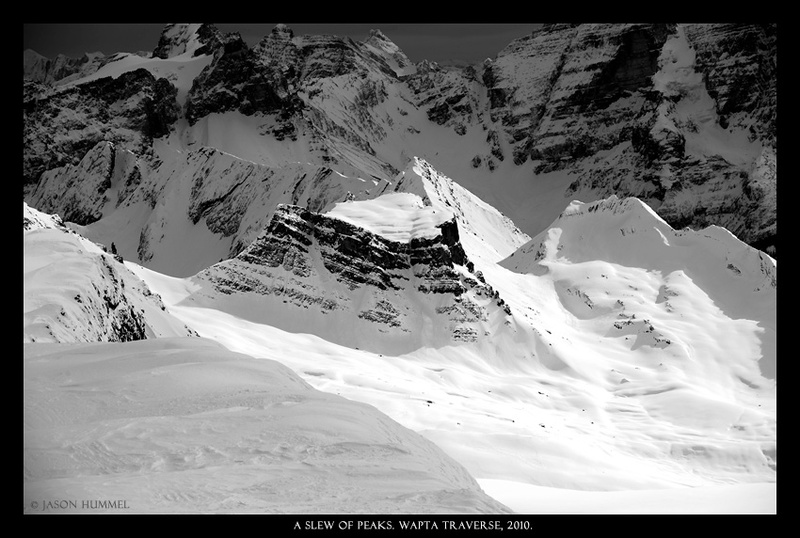 It wasn't such a lonely place, really...more like a quiet companion whose thoughts are as wide as the icefields. We merely can't understand them. And that's fine. I'm happy enough when she grants me passage into her arms throughout steel blue days and coal black nights like she had for the past three wondrous days. 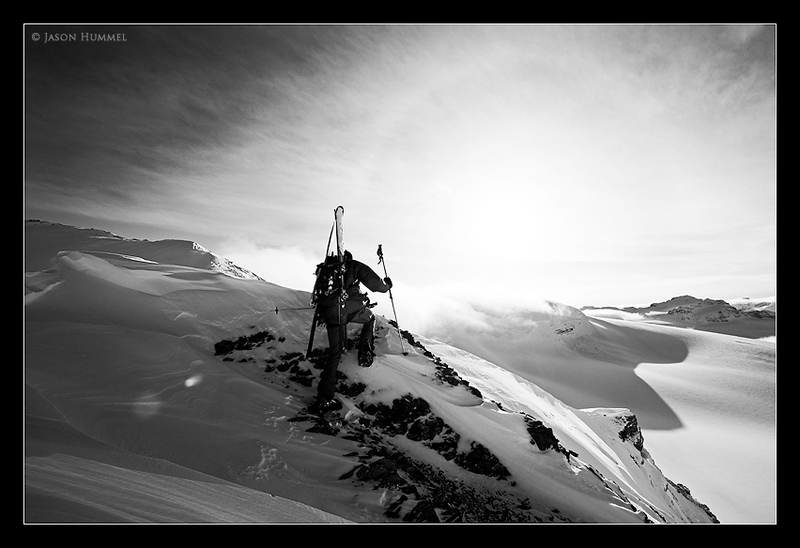 To purchase photos, go to Alpine State of Mind. Not all photos are there, but they are available upon request. If you enjoyed this story, tell us about it by e-mailing or going to the Guestbook. Thanks for taking the time to visit! Sincerely, Jason Hummel.